Blanket Boxes are a must have item in any bedroom. Bigmickey.ie has a wide range of Blanket Boxes in a variety of different styles and sizes. 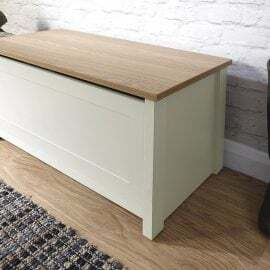 Whether you are in need of some extra storage space or you simply wish to update your interior décor, our collection of Blanket Boxes has something to suit everyone. 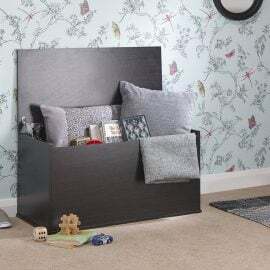 Blanket Boxes are ideal for storing blankets, pillows, bed sheets or toys. 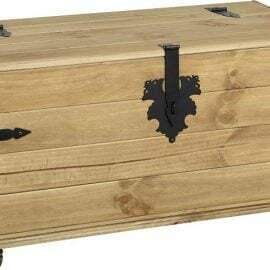 The Cordona Single Storage Chest is available in Distressed Waxed Pine. It is a real statement piece that will bring both style and function to any home. 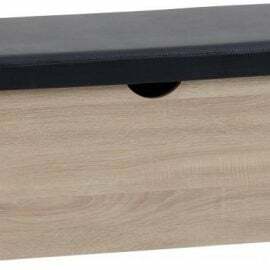 The De Nero Blanket Box is handcrafted from specially selected premium grade oak and its range exudes quality & class. Imposing & majestic in its appearance, this modern design makes De Nero a most sought after range. 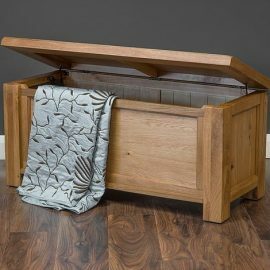 The Lizzie Blanket Box is available in Black Wood Grain or a Light Oak Effect Veneer. The sleek design is a timeless classic and brings both style and function to any bedroom. 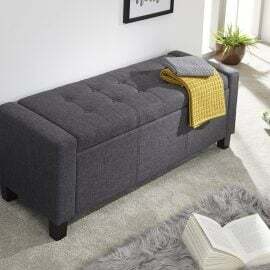 The Sacramento Ottoman Storage Unit is upholstered in high quality Hopsack Fabric and features contrasting wooden legs. The Sacramento hides a 76 litre storage compartment to help you keep you home clutter free. It’s also very comfortable to sit on! 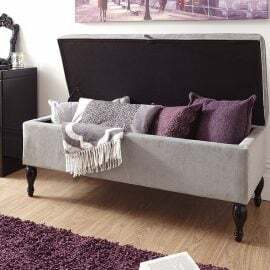 The Sorrento Blanket Box is upholstered in a sophisticated slate grey linen fabric and provides a substantial amount of storage for blankets and linen. It is simple yet stylish and suited to a wide variety of bedroom styles. It is a perfect accompaniment for both of Julian Bowen’s Sorrento and Santorini beds, which are presented in the matching fabric. 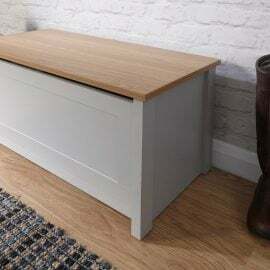 The Thames Ottoman Storage Bench is a classic wooden storage chest. 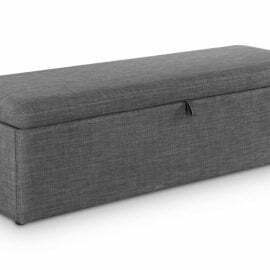 The Panama Ottoman Storage Bench adds significant storage space to any room. Ideal for bedding and blankets. The Vero Blanket Storage Box offers a simply stunning design. Featuring deep buttoned detailing on the lift-up lid, this ottoman is available in fabric, leather or crushed velvet. Ideal for those looking for a comfortable seating area where space may be limited. Crafted to an exceptionally high standard this ottoman comes complete with wooden feet. The seating area of the Vero Ottoman lifts up to reveal a spacious storage area that will help you to reduce the clutter in your home. 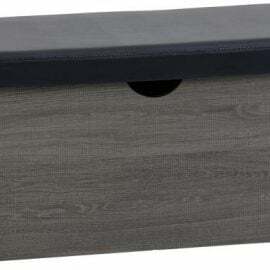 The Wendy Cushioned Ottoman is available in both natural and grey hopsack fabric and with solid wooden turned legs. It looks great in any surrounding as well as providing a fantastic amount useful storage and a comfortable seat. 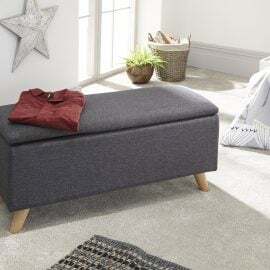 The York Ottoman Storage Bench is the ideal storage solution for any home. Ideal in the hallway, the bench can be used as a seat to help put on or take off your footwear and to keep all of the hallway clutter out of sight.